Lt. 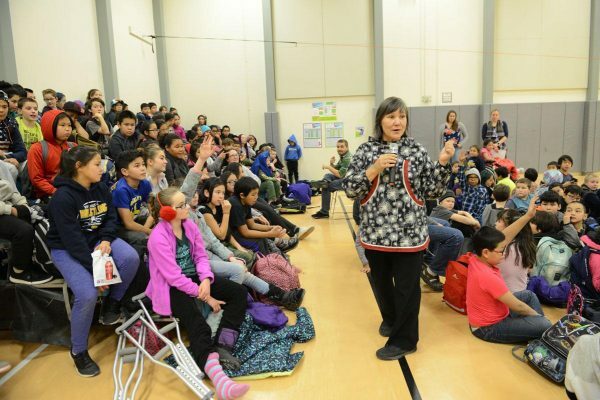 Governor Valerie Davidson speaking at an assembly at Gladys Jung Elementary in Bethel on Thursday, November 15, 2018. Alaska’s recently appointed Lt. Gov. Valerie Narr’araaluk Davidson took her first trip back to the Yukon-Kuskokwim Delta earlier this week, and KYUK’s Christine Trudeau sat down in the studio with her to find out what’s next for the state’s first female Alaska Native lieutenant governor. Wednesday was a trip home for the lieutenant governor and former Commissioner of Health and Human Services. She visited Yup’ik immersion school Ayaprun Elitnaurviat, Gladys Jung Elementary and technical training school Yuut Elitnaurviat. The lieutenant governor is in charge of elections, and she stopped by the city office to thank election workers. “One of the things we’re still in the middle of right now is we have not yet certified the elections, and so there are a couple of close ones still,” said Davidson. Davidson applauded Division of Elections Director Josie Bahnke on her work, especially for broadening the number of Indigenous language dialects that were available to voters on ballots and pamphlets this midterm election. And as for Davidson’s plans come December 4? “People have asked me, you know, what are you gonna do next, and my immediate plan is I am gonna sleep. I’m probably gonna enjoy my first full night of sleep that I’ve had in about four years; at least that’s my hope,” Davidson said. Davidson says that she’s ruled nothing out as far as continuing her life in politics. She had spent 18 years in health care when Bill Walker tapped her to become the commissioner. Now her time in higher office has persuaded her to not shut doors. Davidson says that back in high school, one of her career goals was to one day be governor. “They say life is what happens when you’re making plans, and you know, I started work and started a family, and you know I wasn’t sure that that was really my big priority at the time,” Davidson said. But she says that seeing Gov. Walker’s leadership over the past four years has made her think again about her earlier ambitions. “It is possible to be governor in Alaska and still govern with integrity, and be a good person, and not lose who you are as a person to be able to make those tough decisions,” said Davidson. Davidson expects her next couple of weeks to be consumed by certifying election results and what she hopes will be a smooth transition to the new administration. She says that the incoming Dunleavy administration is going to need to hear from rural Alaskans. As for her thoughts on what’s been characterized as the “pink wave” of women winning seats across the country, and the election of the first two Native American women to the U.S. House of Representatives: Sharice Davids (D – Kansas) a citizen of the Ho-Chunck Nation of Wisconsin, and Deb Haaland (D – New Mexico) a citizen of the Pueblo of Laguna in New Mexico, Davidson says that she’s gratified to be able to finally see elected leaders who reflect those they represent. “For too long women, and women of color, and Alaska Native women have not been represented, and so I would say it’s about time. And that if we want to have true representation in our state and in our country, our leadership needs to look like the people that we serve,” said Davidson. For now, it’s back to Juneau and the transition for Lt. Gov. Davidson.